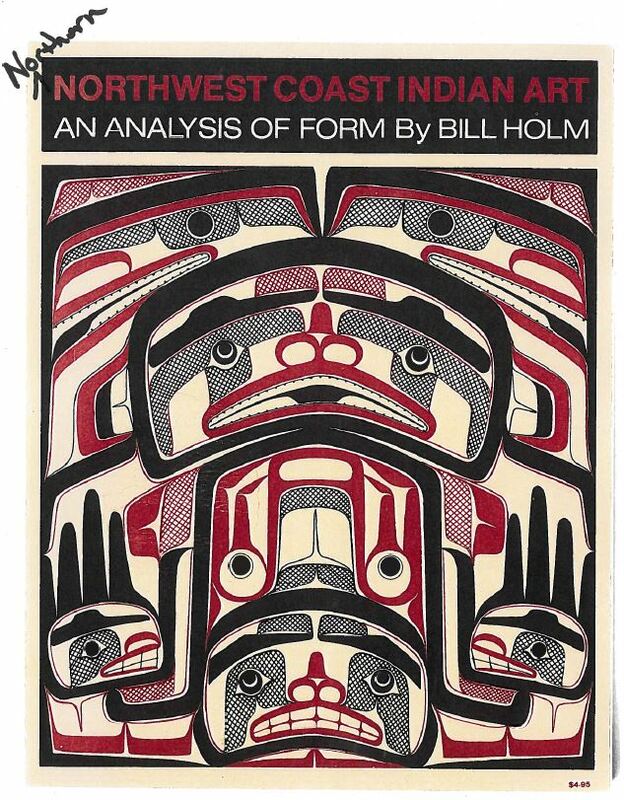 Bill Holm, Professor Emeritus of Art History, and Curator Emeritus of Northwest Coast Indian Art at the Burke Museum, is recognized internationally as one of the most knowledgeable experts in the field of Northwest Coast Native art history. 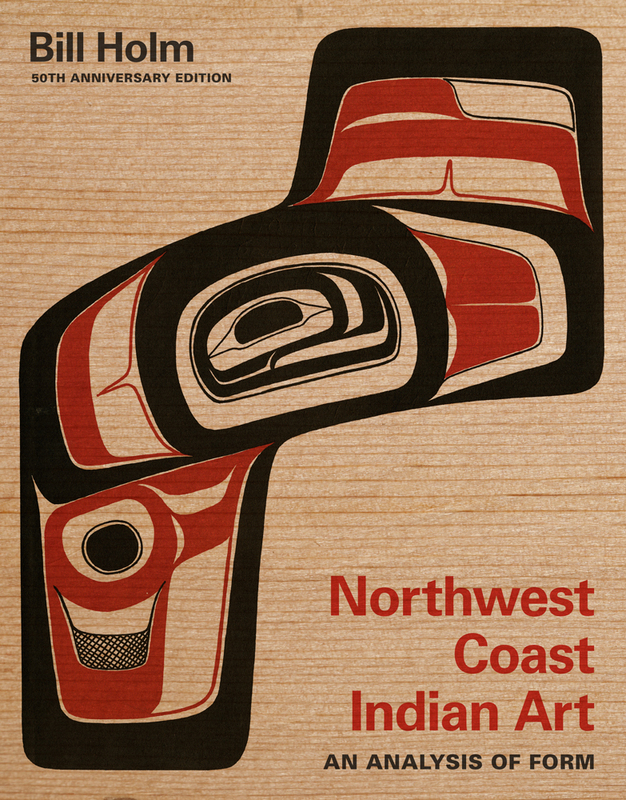 His groundbreaking book, Northwest Coast Indian Art: An Analysis of Form, was originally published in 1965 and is credited with having drawn numerous artists into their own practice of Northwest Coast art. The 50th anniversary edition of this classic work offers color illustrations for a new generation of readers along with reflections from contemporary Northwest Coast artists about the impact of this book. Holm’s original cover with his correction. As I look back on five decades of Northwest Coast Indian Art: An Analysis of Form there really isn’t much that I would change today. I suppose that if I had guessed that it would become a kind of hand book for Northwest Coast Native artists, rather than a somewhat technical analysis of the characteristics of Northern Northwest Coast art, I might have written it differently. Probably the first thing I would have changed would be the title, adding the word “Northern” before “Northwest Coast.” Although the geographical limits of the tradition are stated a number of times in the text, artists and some others using it have often skipped the words in favor of the pictures. The result has been that many have assumed that the art tradition described was pan-coastal. I probably would change a few terms too, and perhaps correct a few questionable statements. My goal in inventing terminology was always to try for really descriptive words. That I sometimes failed to succeed, I regret today. For example, the term “salmon-trout’s head” was lifted bodily from George Emmons’s list of terms given him by Tlingit weavers. I tend now to call this and related design elements “elaborated inner ovoids,” since they almost never represent a fish’s head. Similarly the design representing a wide, frontal face with long, narrow nostrils, that I referred to as a “double eye structure,” I now call a “two step structure,” referring to the unique arrangement of the formlines delineating the corners of the mouth and nostrils of the face. And its related term, the former “single eye structure” is now the “one step structure.” On the other hand, I still hold to the descriptive terms “tertiary line” and “T-shaped” relief over the terms often used by contemporary Northwest Coast artists, “fine line” and “trigon,” believing that the old terms are more descriptive of the figures’ functions. 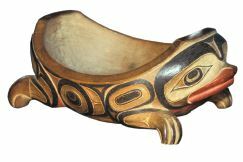 Wooden bowl, Haida. The interrelation of two-dimensional design with sculptural form is well illustrated in this frog bowl by the master Haida carver, Charles Edensaw. University of British Columbia Museum of Anthropology A7054. As the characteristic shapes and arrangements of the elements of northern Northwest Coast two-dimensional art began to become familiar to me I came to the realization that there was a sort of grammar or syntax to it that was not unlike that of a written language. There were “rules” that transcended tribal and linguistic boundaries on the northern coast and that were followed in remarkable uniformity by artists of all the tribes of the area. Like a written language, it allowed individual variation while still conforming to the rules. Just as a proper and proficient use of writing doesn’t guarantee a great poem or gripping novel, the “rules” of the northern Northwest Coast “formline” don’t automatically result in great art. That is left to the artist. Woven spruce root hat, Haida. 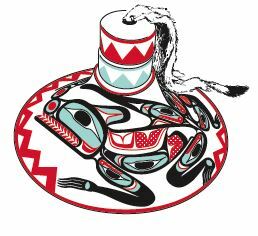 A configurative design of a split wolf is painted around the hat in black, red, and blue-green. Private collection. Dr. Gunther readily agreed, and the result was the basis for “An Analysis of Form.” The paper lay fallow for half a dozen years, when I was urged by friends to try to publish it. It sounded like a good idea, but I began to realize that it was incomplete, lacking any kind of documentation. It was all in my head. Again I went to Dr. Gunther for advice. This was in the days before personal computers, and she suggested that I try Keysort Cards to record characteristics and organize the results. I recorded characteristics of 392 specimens on 400 cards and used the results to fine-tune my conclusions. Then, what to do? I had no idea of how to proceed toward publishing the study. One day I was in a laboratory in the Burke Museum, visiting a friend who had generously let me use a picture of a contemporary silver bracelet he owned as an illustration of how the design system had broken down. Dr. Walter Fairservis, then the director of the Burke, was in the room and heard our conversation. This entry was posted in Book Excerpt, Native American and Indigenous Studies, Uncategorized and tagged Bill Holm, Burke Museum, Northwest Coast, Northwest Coast art, Northwest Coast Indian Art on January 28, 2015 by uwpressblog.